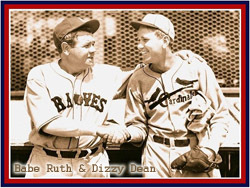 In a showdown of two master showmen, Dizzy Dean upstaged Babe Ruth. Ruth, 40, entered his final big-league season with the 1935 Braves. The fading home run king had gone to the National League after 21 years (1914-34) in the American League with the Red Sox and Yankees. Dean, 25, was the colorful Cardinals ace and reigning NL strikeout king who had earned 30 wins the year before and pitched St. Louis to the 1934 World Series championship. They faced one another for the first time in a regular-season game on May 5, 1935, at Boston. Ruth and Dean greeted each other cordially before the game and took part in a newspaper-sponsored promotion with local youth players. Then, it was show time. In his first at-bat, Ruth walked. When Ruth came to the plate for the second time, Dean upped the ante. “I figured that if I didn’t steal the show he would,” Dean said. As Ruth took his practice cuts, Dean smiled at him and turned toward his outfielders. Then, Dean went to work on Ruth. He got the count to 1-and-2. On his fourth delivery, Dean unleashed his best fastball. Ruth took a mighty swing and missed. Dean had his strikeout of the Bambino. “Babe almost broke his back going for that steaming third fastball,” according to the Associated Press. In his third at-bat, Ruth grounded out. In five games against the Cardinals in 1935, Ruth batted .071 (1-for-14) with a single, three walks and five strikeouts. With his overall average at .181 in 28 games that season, Ruth retired at the end of May. In his prime, Ruth faced the Cardinals in two World Series. He hit .300 (6-for-20) with 4 home runs and 11 walks in the seven-game 1926 World Series. In the 1928 World Series, Ruth hit .625 (10-for-16) with 3 home runs and 3 doubles in four games.